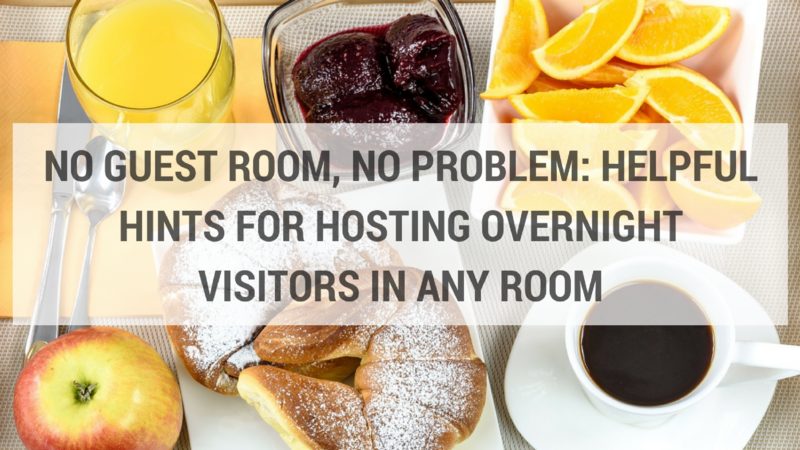 Not everyone is fortunate enough to have a spare room for overnight guests. The best you may have to offer is your living room sofa. But no matter how compact your residence is, there are a few tricks you can pull off to help your guests fit in comfortably. Fold away sleeping quarters: Instead of a sofa, invest in a daybed or futon. During the day you can use it as a fully functional couch and when guests come to stay, voila, you have a spare bed. If you don’t have room for a futon or sofa bed, a sleeper chair will work just as well. Extra seating arrangements: Not everyone is a fan of sitting on the floor. If you don’t have room for extra chairs, bean bags are a great idea. They’re comfortable and inexpensive. Here’s a good place to look if you want to find bean bags. Get an instant bed: A blow-up mattress is an easy and affordable alternative to a futon, particularly if you’re really low on space. Furthermore, an inflatable mattress can be stored away under your bed when not in use. Stow away the luggage: Luggage can be a real pain if people have to step over it every time they move around the room. If you can’t make room in your closet, get creative. Store small cases under tables and larger ones under your bed. Rearrange the furniture slightly so suitcases can be tucked behind your sofa. Find some clothes storage: Don’t expect your guest to live out of his or her luggage. If you can’t make any spare room in your closet, consider adding a small wall bracket for hanging clothes, or at least a few hooks. If you don’t have laundry facilities in your home, be sure to let your guest know where the closest Laundromat is. Think about the privacy issue: Even though you may know your guest very well, it’s still important to give him or her plenty of privacy. You can easily create privacy in an open-plan studio with a room divider or temporary curtain. If you’re sharing a bathroom, make sure that the door locks adequately. If your guest is going to be staying for a while, make sure you work out a shower schedule. Provide necessities: Even if your guest is crashing on the sofa, the least you can do is provide clean linen and comfortable pillows. Keep spare bathroom tissue and clean towels close at hand. Keep it tidy: Clean your space and keep clutter to a minimum so it doesn’t feel overcrowded. Empty garbage and make sure the dishes are washed so your guest doesn’t feel obliged to take on housekeeping duties. Be considerate about scheduling: If your guest is sleeping in the living room, be mindful of his or her sleeping schedule. Try not to party all night if your temporary roommate is waiting for everyone to leave before going to sleep. Add a little convenience: Consider the little things your guest may need, such as a power bar for charging phones and tablets. Write your Internet password on a card so it’s easy to find. Create a homely atmosphere: Just a simple thing like adding flowers to your living room can make your guest feel more welcome. It will go a long way to making your space seem more inviting. Assess your living room like a bedroom: Do your curtains block out sufficient light? Is your living room warm enough at night to allow your guest to sleep comfortably? Is there a lot of noise from the street or your neighbors? Quick fixes like an extra blanket and earplugs can make all the difference. Provide a few essentials: Putting out a tray of necessities is thoughtful. It can save your guest having to ask you for things he or she has forgotten to bring. For example, travel size toothpaste, soap, and shampoo are essential items. You could also add some bottled water, potato chips, and other snacks to make a small but welcome care package. If you’re having a guest stay over for a while, you may have to change your daily routine temporarily. Don’t stress about this, it doesn’t mean you have to cancel all your plans. Keep your morning trip to the gym and your evening glass of wine, but be flexible. The important thing is that you enjoy each other’s company. This is a featured post from Lucy Brennan. Lucy Brennan enjoys spending some of her free time writing lifestyle articles aimed at like-minded women around the web. She has teenage daughters and a younger son as well as dogs and other smaller pets.